There's an unaddressed loophole in the NFL overtime rules. The rule states that if the team that gets first possession gets a field goal on that possession, the second team is guaranteed a possession of the ball. What if the initial possession takes up the entire 10 minute overtime and time expires on the kick? I call that great ball management by the offense. But until it's been realized a few times in adjacent years, I wouldn't call it a loophole. Agreed. It's basically the equivalent to what Dean Smith used to do with the Four Corners offense in the 80s. When it becomes a persistent issue, rule changes will eliminate it. And, really, how many teams could sustain a 10 minute possession? Much less do it consistently enough to use it as a strategy. There's been one 10+ minute drive ending in a field goal this season and only 12 over 8 minutes (out of 363 drives that ended in a made FG). So technically you could kick the field goal as time expired. To sustain a 10 minute drive though you would need at a minimum 15 plays, using all 40 seconds each play. Pretty hard to get 15 plays off without turning it over on downs, and without making it all the way into the end zone. It has happened though, including recently. It helps to have a few offensive penalties, followed by defensive holdings. 1. 1st and 10. Gain 8 yards. 2. 2nd and 2. Offensive Holding, repeat down. 3. 2nd and 12. Gain 5 yards. 4. 3rd and 7. Defensive Holding, five yards and auto first down. Total yards moved: 8 yards. Sure, clock stopped on play #5, but could run three minutes off, I think. so in reg season not a loophole. 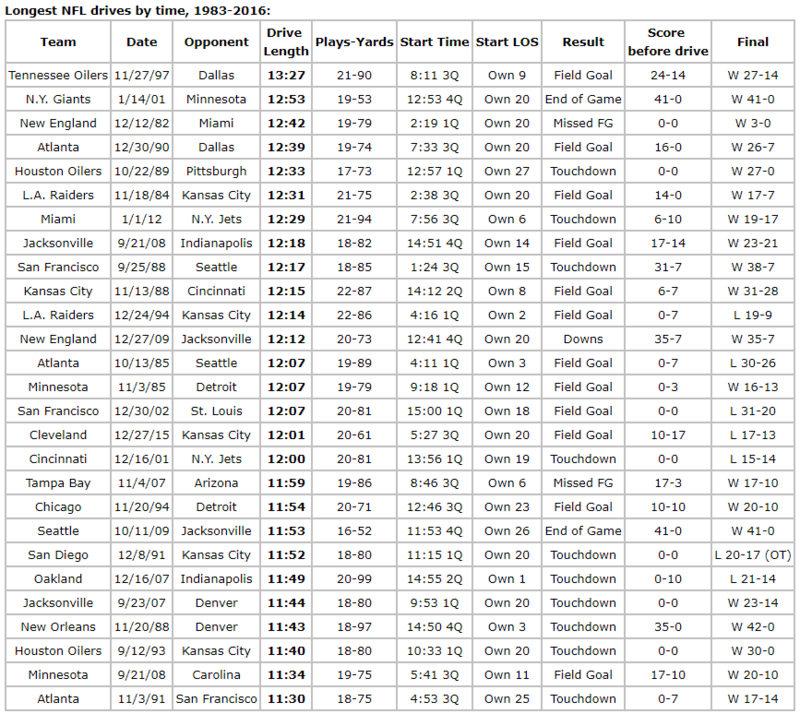 just requires long sustained drive (penalties can stretch the number of plays and total yards gained). in playoffs, the OT period is not an end-of-half and so second team gets opportunity to possess the ball. The more pass-heavy NFL offenses these days are less likely to sustain a 10-minute drive than in the old days. Dallas and Jacksonville are the only 2 teams off the top of my head that emphasize ball-control offense. Gives me a feeling of nostalgia for the old Bill Parcells Giants teams that would run the ball down other team's throats. That 10-minute drive against the Bills in SB XXV was priceless.